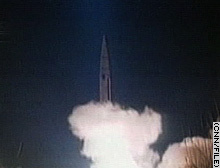 WASHINGTON (CNN) — China last week successfully used a missile to destroy an orbiting satellite, U.S. government officials told CNN on Thursday, in a test that could undermine relations with the West and pose a threat to satellites important to the U.S. military. The test took place on January 11. The official said that U.S. “space tracking sensors” confirmed that the satellite is no longer in orbit and that the collision produced “hundreds of pieces of debris,” that also are being tracked. “We are aware of it and we are concerned, and we made it known,” White House spokesman Tony Snow said. “Naturally, we are concerned about it from the viewpoint of security as well as peaceful use of space,” said Yashuhisa Shiozaki, chief cabinet secretary. He said Japan has asked the Chinese government for an explanation. Britain has complained about lack of consultation before the test and potential damage from the debris it left behind, The Associated Press reported. Low Earth-orbit satellites have become indispensable for U.S. military communications, GPS navigation for smart bombs and troops, and for real-time surveillance. The Chinese test highlights the satellites’ vulnerability. “If we, for instance, got into a conflict over Taiwan, one of the first things they’d probably do would be to shoot down all of our lower Earth-orbit spy satellites, putting out our eyes,” said John Pike of globalsecurity.org, a Web site that compiles information on worldwide security issues. “The thing that is surprising and disturbing is that [the Chinese] have chosen this moment to demonstrate a military capability that can only be aimed at the United States,” he said.